MDG recently developed a pediatric emergency room billboard campaign with a designated microsite for four of the hospitals in the HCA East Florida region with dedicated pediatric emergency rooms. Rather than take an urgent or serious tone that would incite fear and worry, our team developed a playful campaign that captures attention and resonates with parents of young children by showing kids being kids. The goal of this campaign was to distinguish the specialized pediatric emergency care of the four HCA East Florida-affiliated facilities with pediatric emergency rooms and position them as child-friendly facilities. These include Kendall Regional Medical Center in Miami, Northwest Medical Center in Margate, Plantation General Hospital in Plantation, and Palms West Hospital in Loxahatchee. Palms West Hospital benefits from a unique affiliation with Miami Children’s Hospital, a recognized leader in pediatric healthcare, which enables physicians from Miami Children’s Hospital’s emergency room to conveniently provide outstanding medical care to the children of Palm Beach County at Palms West. This healthcare marketing campaign consists of a series of billboards, each featuring a photograph of a young child doing typical childlike things. 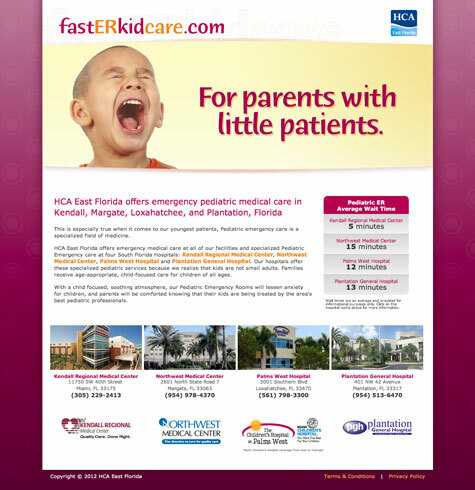 The copy includes a call-to-action URL that not only defines a very specialized service but also speaks directly to the target audience of parents and uses the phrase “little patients” to convey that their child’s emergency care is at the heart of our message, as well as to add a touch of humor with a double entendre alluding to the “little patience” often shown in the emergency room. That simple phrasing grabs their attention and may even lead to a laugh, which makes the message even more memorable. 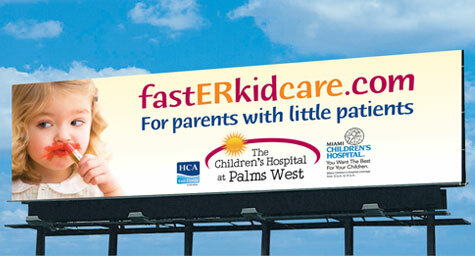 The microsite, www.fasterkidcare.com, features similar images and parent-focused headlines, and defines how these four HCA East Florida hospitals provide specialized pediatric emergency care in a comfortable, child-friendly atmosphere. The microsite also provides direct links to the four hospitals, as well as lists the average waiting times for each of the pediatric emergency rooms. When it comes to a child’s emergency care, parents need to know where to go and this campaign both shows and tells them. At MDG Advertising, our 360° marketing approach uses just the right mix of traditional and online media to reach your healthcare marketing goals. While some industries may fare better on TV and others on YouTube, we strive to create a balanced approach where digital and traditional marketing efforts support each other and your message is tailored to the medium. To stay on top of the latest healthcare marketing trends that will make an impact for your healthcare brand, contact MDG Advertising today at 561-338-7797 or visit mdgadvertising.com.